Terese Shaw is an FBR Adoptions Coordinator for Fresno Bully Rescue. 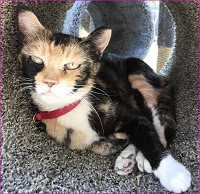 FBR shares their animal rescue adventures with us every other month. 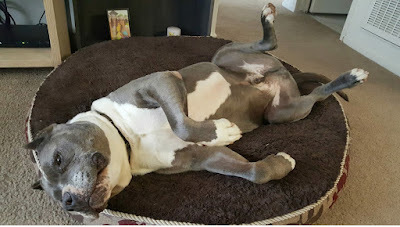 Fresno Bully Rescue Adoptable, Seamus, seems to have an internal clock that tells him when the weekend has arrived. That means one thing: his favorite volunteer, Anne, is bringing him his own personal donut! After devouring his Saturday morning treat, it's off for a leisurely stroll and a few cuddles. Seamus is considered a senior at the age of nine, and as seniors dogs do, he has visibly aged in the past two years. He's gotten a little grumpier, become more sedentary, and he's thickened in the middle a bit. We've noticed as the white blended into his muzzle has slowly started spreading up his face. One thing that hasn't aged is his curiosity and his love of a new fluffy toy. Watching him proudly carry his new treasure back to his kennel will make anyone smile. A big ol' man with a tiny, fluffy toy makes a person remember it's the simple and small things in life that can make for the most happiness. We originally were contacted about Seamus in 2014 when he was found roaming around in Fresno. The finder brought him to FBR, and he was adopted three days later. Two years ago we got a call from a northern shelter that they had Seamus. After numerous attempts to contact the owner we went and picked up Seamus. He’s been with us since then. Seamus will make loving him easy. The old man will find you brilliant and amazing, even if you're just sleeping. Just ask Kira, an FBR volunteer that loves him and will take him home for an occasional overnight visits. When asked what is memorable about the sleepovers, she remarks there are a couple of things. The cutest thing about the sleepovers she tells me is that while she is fast asleep, he has to make sure she is still there. He will gently nudge her until she reassures him with a pat or two and satisfied with that he goes back and falls asleep on his pillow. Secondly is that his farts are legendary! Hopefully soon a home where there are endless snacks, a couch to sleep on, and a family to love him will see him through his senior years. 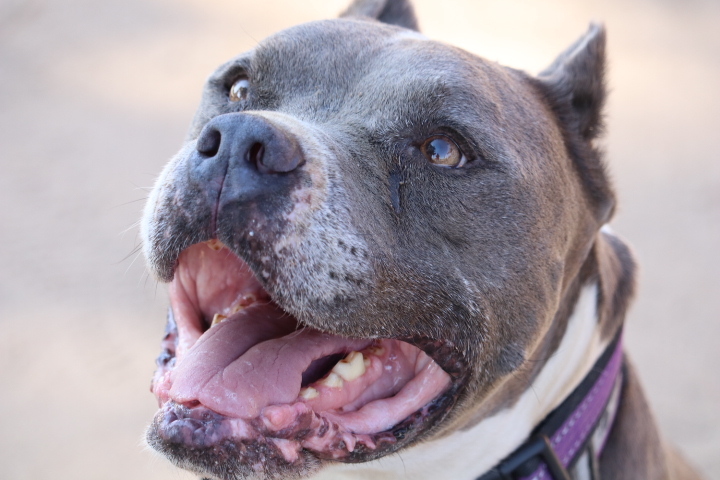 He has so much to offer a family that is ready to love a senior that is full of love, gratitude, and peacefulness. Just don't forget the donuts!